Registration for the Fall Giveaway Season is Closed. The fall tree giveaway season is upon us! This season will be our first entirely focused on community giveaways in order to better serve neighborhoods most in need of trees. Explore our community partners below and contact community groups directly to ask about their yard tree giveaway. Don’t see your neighborhood on the list this season? 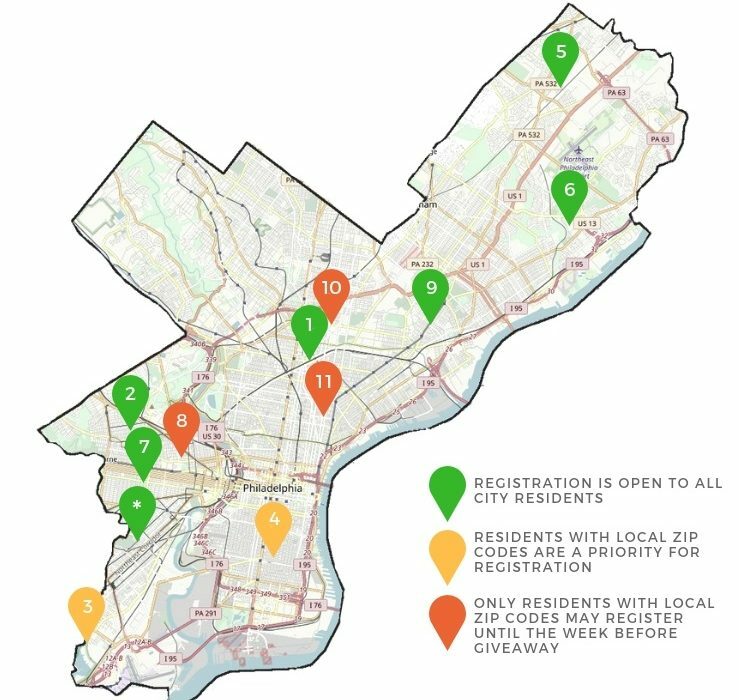 Partner up with an organization in your community and contact TreePhilly to get notified when applications for the Spring giveaway season are released. If you have limited mobility and cannot pick up and plant your tree, we are offering a free delivery and planting service. Click here to find out more OR call our office or email our office and leave your name and address and we will mail you a paper application. 9. Sunday, November 4th: AS OF 10/29 ALL TREES HAVE BEEN PRE-REGISTERED FOR THIS EVENT. ARE THEY GIVEING AWAY FREE TREE’S FOR ZIP CODE 19144 AND WHEN? Thanks for reaching out. There are no giveaways in 19144 this year. I would recommend grabbing a tree from the Casa de Dios Nuevo Pacto giveaway. Hi. I was interested in the magnolia but I saw that it is “sold out.” Is there any chance one will become available? If someone does not claim theirs, would I be able to get it? I don’t believe every giveaway is sold out of Magnolias. Which neighborhood are you from so we can advise you which giveaway to contact to get registered for a magnolia. Hi. I’m in Fishtown. Please let me k ownif there is one close where I can register for one. Thanks! Hi Daniel! You should register for the Frankford CDC giveaway on November 4. Disappointed that there are no tree giveaway events in the Northwest section of the city.. can you explain why? Thanks for reaching out. There are no giveaways in the Northwest because no community groups applied to host neighborhood giveaways from that area of the city. We award grants to community-based organizations and coalitions based on strength of the group and plan as well as the need for trees in each neighborhood but they have to apply first! Any fruit trees in zip 19128 or close to us ? Hello! The closest giveaway to 19128 is the first giveaway at Casa de Dios Nuevo Pacto, 726 W Ontario St, Philadelphia PA 19140, on the 29th. How many trees are you allowed to get ? Great question! We’re leaving this up to the community partner. In general, if you’re looking for multiple trees the best bet would be to come at the end of the giveaways in case there are extras. I’ve called the number for the Assoc. Polish giveaway numerous times and no one picks up. Is there another way to get in touch before they’re all given away? Joyce, we have also listed an email address for APH that you can try!